This listing appeared in Motor Coach Age, August 1969 issue. NYCTA Staten Island and Manhattan assignments. Just curious...why was the Fresh Pond garage listed under "Brooklyn"? Probably because many of the bus routes ran in Brooklyn. Where are the Old Looks assigned to Fresh Pond? There might have been some New Looks in the 1-190 series as well. 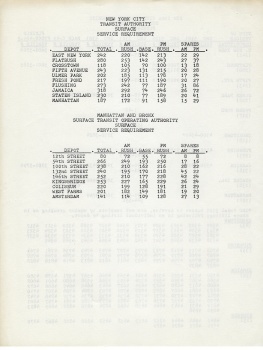 Of the buses at the Manhattan ('MAN') depot, which ones - the 38 within the 5301 bunch, or among the 149 5303's - would have been more likely used on the M-13 Journal Building shuttle bus in the last months between that February 1966 list and its May 1966 discontinuance following the demise of the Journal-American? I know the 5303's were prominent on the then M-3 49th-50th Street crosstown . . . 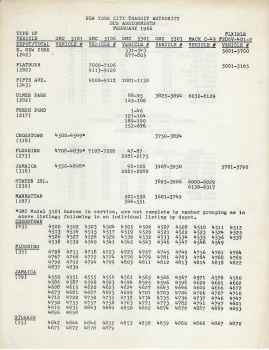 But it does prove that the Flxibles were indeed off-off Broadway / dinner theatre / roadshow in where they plied their routes, compared with the GM's ordered for MaBSTOA in that same stretch (quite a few of which actually travelled along the Great White Way). Although signed for route 44, West Farms Square Bronx (and a sub sign that says "World's Fair") this Flxible "New Look" worked in Manhattan as a demo. So far I have only seen it signed for the M3, 49/50 Street Crosstown. 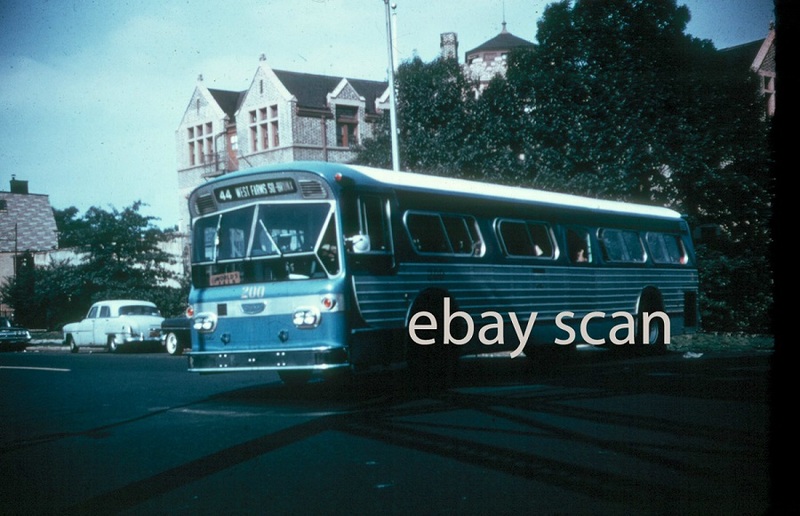 This particular bus wound up in Terminal Island Transit, California painted in the same color with the same fleet number, 200. The only other Flxibles working the Manhattan streets before the city wide purchase were the ones on Avenue B and East Broadway Transit and the one demo that Fifth Avenue Coach operated as a demo sometime in 1961. It is thus one of life's ironies that when the TA got their first Flxibles in 1964-66, the only excursions to Manhattan they ever made were via B15, B39 and B63.